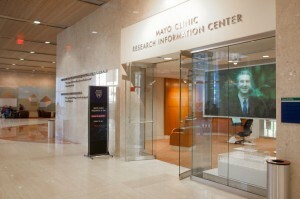 Several regenerative medicine activities at Mayo Clinic are currently displayed in the Research Information Center in Rochester, Minn. The center features a new comprehensive video on regenerative medicine. The Research Information Center is located in the Gonda Building, lobby level. Through interactive displays and scientific visualizations, visitors can learn how Mayo’s multidisciplinary research effort is changing the practice and delivery of medical care.